Men’s outfits with sneakers. No matter what time of year, sneakers have become a worlwide favourite style of footwear. Not only are they found in an array of styles, sizes and colours, but are so diverse that they can be matched with almost any outfit all year round.We earlier talked about 14 stylish men outfits with timberland shoes. 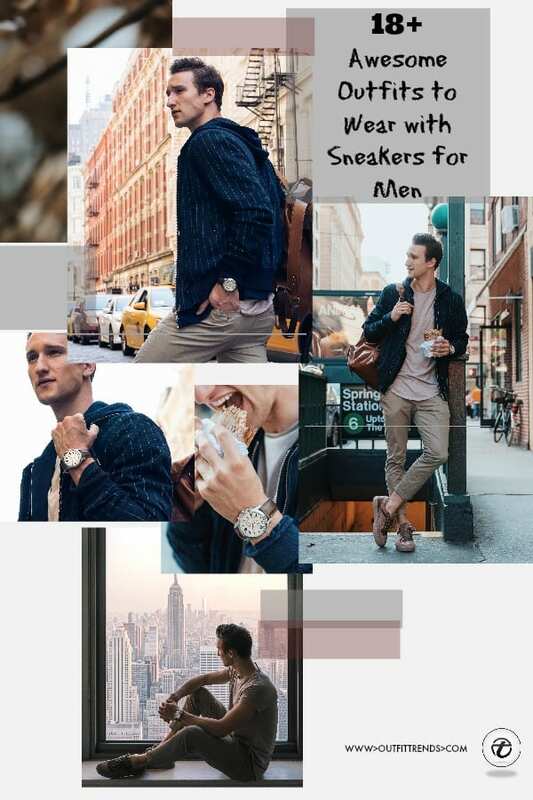 From sportswear, to streetwear and even to biker wear, sneakers Women will be seen wearing sneakers frequently however it is becoming more and more common to see guys rocking the sneaker style too. From street style to beach style, there is a look for every guy which incorporates stylish sneakers. High tops, low tops, fabric or leather all are viable choices when it comes to finishing your look. This post contains 18 best ways for guys to wear sneakers and latest sneaker fashion 2015. Why not use them to recreate your own stylish get up with sneakers. It is very important for guys to keep hair nicely combed and done up. Messy hair will detract from your chosen style and can look terrible. Also keep accessories to a minimum, too much bling will completely kill your outfit especially if it incorporates sneakers. Match leather high tops with a striped pattern leather jacket is great for a smart casual look. Simple skinny jeans and black striped top continue the style and finish this look. These shoes are great for Winter Wear. 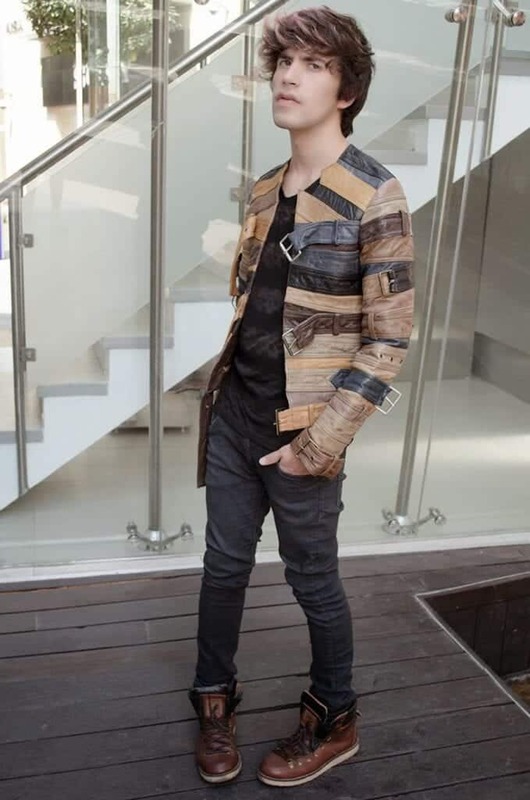 If you like wearing leather jackets, do check out these Leather Jacket Outfits for Men. You can still wear sneakers in winter. Crisp woolen coat with striped jumper and jeans. Accessories for this look include scarf, hat, gloves and sunglasses. Crisp and clean white sneakers complete this stylish city look. Perfect for students and travellers, this look is stylish and casual. Tartan button up shirt with beige jeans finished with red sneakers. If you love traveling, check out these 18 Winter Travel Outfit Ideas For Men for the best travel tips and outfit suggestions. Thick woolen coat with jeans and clean white sneakers. A great look for businessmen and city folk. Check out these Men Long Coat Styles for some more awesome styling tips. Simple yet effective look with grey jeans, striped top and baseball style jacket. Low top white sneakers finish this look off. Distressed style jeans and distressed, unlaced high top sneakers with blazer, cardigan and grey top make for a great city casual look. Accessorise this look with a quirky colored tie. Here are 30 Best Men’s Outfit Ideas to Wear with Monk Strap Shoes. A great and stylish look for broader guys which uses sneakers perfectly. Open tartan shirt, rolled up jeans and black sneakers. Top it all off with a simple beanie. Get noticed at college or university with this stylish look with sneakers. Black blazer and skinnies with beige top and leather look high tops make for a perfect look. Complete this style with sunglasses, and cheeky touches of jewelry.Perfect footwear for Skinny Guys. Here are 20 Shoes To Wear With Guys Sweatpants. And here’s our favorite college look with coffee brown colored sneakers by Paul Andrew, paired with brown chinos. City hip hop style. Incorporates black leather jacket, top and skinny jeans and finished with super bright red sports sneakers. You should definitely have a look at these Red Shoes Outfits For Men. Black sneakers go with most outfits especially this simplified casual look with denim and jeans. Black jacket with simple white t-shirt and black skinny jeans matched with crisps, clean white sneakers and accessorised with sunglasses and large holdall bag. Here are 16 Trendy Ways to Wear White Shoes. Charcoal suit with sneakers and finished with a stylish trilby hat. Keeping warm with jumper and jacket. Rolled up jeans with designer sneakers for men adding a hint of summer. This look is definitely not something that anyone can wear, but if you’re daring enough and like to go for bold, shiny outfits then do give it a try. Here we see a vinyl jacket in black, that has been paired with purple sweatpants and vans sneakers. It’s a sporty but funky look, making it a unique combination. If you wish to buy this outfit, then you can get the jacket from ASOS for $103, the purple sweatpants from PacSun for $54.95 and the Vans authentic checker tape shoes are currently available here for $99.95. You should also have a look at these 20 Fashionable Ways to Wear Vans Shoes. Winter wax coat with matching skinny jeans. I wouldn’t say these sneakers are great in rain but they definitely suit this outfit. Here are 18 Best Winter Outfits Ideas For Men To Stay Fashionably Cozy. Perfect look for teens. Leather jacket over a simple white t-shirt matched , skinny jeans and black beanie. Subtle contrasting brown high tops add a splash of colour. Feeling brave? Why not rock the neon look with green high tops? With Leather jacket and patterned t-shirt, these will definitely get you noticed. Go against the grain and add some stripes to a satin look suit for a hint of rebellion. Contrasted beautifully with blue low top sneakers which give a more casual feel. Okay, I’m sorry, but in the first picture, that is by far the UGLIEST jacket I have ever seen in my life. In the picture with smart casual the shirt light jeans watch and converse what make shortness is that?